When it comes to locking doors it is a very easy process. With modern cars, the door can be locked with the push of a button. Sometimes the process is so easy we do it by accident. And sometimes those accidents leave you locked out. It happens to everyone. It happened to me in Hawaii (see the conclusion for the whole story). Luckily I had some experience with car lockouts. Experience that I am now going to share with you, so when you get locked out you are just as prepared. 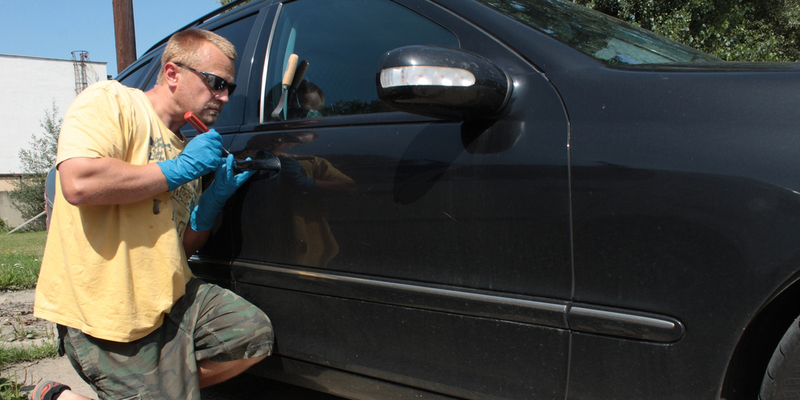 There are three basic ways of getting back into your locked car, and they all have endless variations. Unlike door lock technology cars come out with new models every year and people try to make their models last as long as possible. As a result, auto re-entry is a vast grab bag of possible solutions. Each solution is more of a jumping off point then it is an easy fix, but once you know them all you can get back into your car and enjoy the beautiful Hawaiian beaches (unless you aren’t in Hawaii, then you might have to drive to a beach, the beauty of which will vary). The most common practice in auto locksmithing is to wedge the door open. This method looks significantly more harmful than it is. 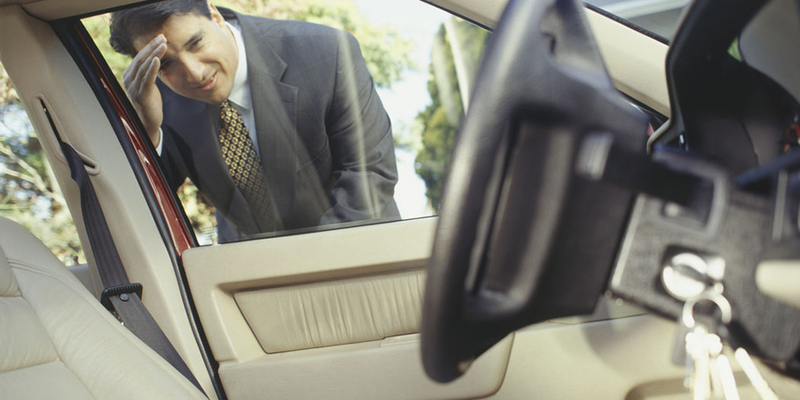 In truth, wedging is one of the safest and most harmless ways to re-enter your locked car. The wedge is placed between the door and the door frame of the car. It is pushed in the crevasse to create a point of entry for a bar, or other long reach tools. If you own a BMW that was manufactured anywhere from 1996 to 2000 you are going to need to focus on grabbing the keys with your tool (hopefully they are not in the trunk). The reason for this is that BMWs from those years turn off the car’s battery when the keys are not in the ignition, making the electronic door locks useless. If you don’t have a BMW from 96-2000 it is pretty simple: Use the wedge to wedge the door open, and use any kind of long bar or tool to manipulate the door locks. There are several types of wedges that you can use for this type of entry. 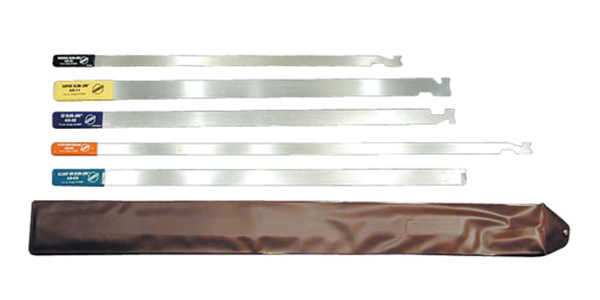 An automotive wedge is used by many locksmiths because it provides a softer and more flexible surface that will not scratch the door. It appears much like a Something like a common household rubber door stop. You could also just simply cut a piece of wood into a wedge shape, but if you are concerned with scratches to the car, I would suggest laying down a piece of fabric (maybe a rag or small towel) so the wood does not scrape against the weather strip or paint. An even more professional way of wedging a car door is to use an air wedge. An air wedge is an inflatable bag that when deflated can be slipped between the doorway. Once the air wedge is in place it can be inflated to wedge the door open enough for a long reach tool to be used. A manual wedge can also be useful, but because of its power, it is best to use this tool with extreme caution. Before placing the manual wedge in the doorway, wrap it in a cloth so it does not destroy your paint job. Fasten it by placing the “L” in the doorway and then pulling back to slip the tool into place. As you turn the apparatus you will be able to see that the gap in the closed door is widening. Too many turns will result in bending the door or breaking the window, so be very cautious. With probe tools, the possibilities are similarly as endless as the ways to wedge a door. In conjunction with the wedge, the door can be opened with these types of tools. The wedge’s opening can be exploited by probing into the hole and releasing the lock. Depending on the make and model of the car the probe will need to work differently. Most cars can simply be opened with a rod that presses the unlock button, but not all cars have such a feature. With many American brands of cars, the doors have side sliding locks or side of the door push buttons, and that may require a probe with a hook. A hook could also be used in cases where you need to retrieve your keys, such as when the battery is dead. A dead battery could disable the electronic functions that make the buttons on doors open the corresponding locks. A hook or a lasso type tool are also great for upright locks (also known as post locks). Grabbing an upright lock by lasso or hook requires you to just pull up on in order to unlock the vehicle. 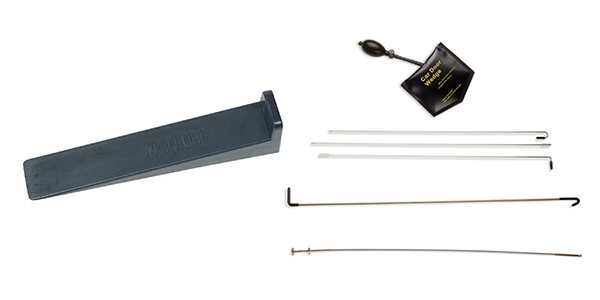 Wire coat hangers or sticks may also be used to fashion makeshift probe tools in times of need, but there are several things to keep in mind. You always want to make sure that whatever material you are using is strong enough to manipulate the lock. If it is a stick, you don’t want it to break, and if it is a wire hanger you do not want it to bend while in use. With the wire hanger, you can strengthen the device by twisting two sides of the wire together, and you can also bend it yourself to fit the need of the car. The plus of a wire hanger is that you may not even need a wedge depending on the tightness of the doorway. Always make sure that the entry you have made with your wedge is large enough for your probe because scraping against the car with the probe could ruin the paint on the automobile. For this reason, it is good to make sure that your probe is not too large in diameter because any unnecessary stress to the door could damage the frame or the window glass. Keep the size of the probe no bigger than a pen, in diameter. It is also best to handle this task quickly because it is not great for the car to have prolonged torque from a wedge. 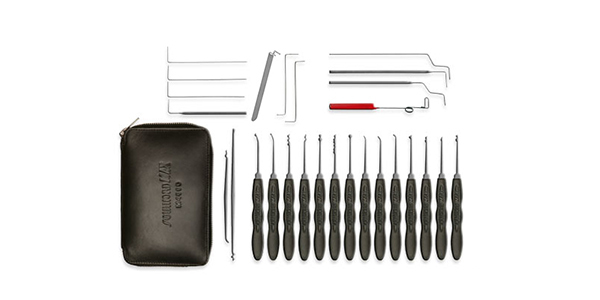 Assess the type of probe tool that you will need to manipulate your particular type of door locks. Have your probe tool no larger than the diameter of a pen. Make sure your tools are up to the task in terms of the pressure they can withstand. Secure the area around the wedge to assure that the car is not scratched. Place the wedge, and make sure that it provides enough of a gap to place your probe tool. Proceed carefully, but do not leave the wedge in the doorway for an extended amount of time. Using a Slim Jim is probably the method most commonly thought of to open a locked car. This tool is probably the most common type of closed doorway tool, and what that means is that the doorway remains sealed even as the car is being opened. How these type of tools work is they are placed between the window glass and the weather stripping of the door. In the case of the Slim Jim, it is most effective on upright locks (or post locks), with a few exceptions. The way that the Slim Jim is used relies heavily on finesse and a light touch. Once a tool is placed on the inside of a door there are a lot of wires and electronics that can be damaged by haphazard use. The Slim Jim is moved along the path of the upright lock until the lock can be seen moving. Once the Slim Jim has moved the lock it can be gently pulled upwards to unlock the door. In other, older cars the Slim Jim can unlock the door by simply pressing down over the keyhole to the car, such as the case for a 78 Firebird. There is no set universal application for a Slim Jim, but the most applicable method is the upwards pull because too much experimentation might lead to your car door needing to be replaced. There are countless other closed doorway tools that function by similarly entering the door through the gap between the window glass and the weatherstrip. What sets them apart from the Slim Jim is that most of them rely on resurfacing on the other side of the glass. Once the tool is on the other side it will be shaped depending on its purpose. The Autobuster tool is a closed doorway tool that works on sliding door locks and side door locks. This type of tool is used commonly with cars manufactured by the US, whereas the Japanese tool is designed for cars manufactured by Japan. Japan’s go-to style of door locks are the thumb locks, which lay on the armrest of the door and have an indentation for your thumb. A thumb lock needs a tool that is going to be able to press down, and a sliding lock is going to need a tool that hugs the side of the door. All of these types of tools are more specialized because the shape is designed with the purpose of going under the window way. Changing the shapes of these tools might harm the interior of the door (snag wires), or prevent the tool from resurfacing. The need for practice with these tools gears them more toward professional use because the unsupervised practice may harm the car. Assess your door locks and determine what type of closed door tool will be able to open your locked door. Be careful when moving the tool in the inside of the door. Be cognisant of any snagging that happens while the tool is in use because this might be a sign that the door has been damaged. This is perhaps the least common method for automotive reentry, because of the ever-changing nature of car keyways. That being said, if you do have an older car this might be an avenue you wish to pursue. Standard single picking and raking are always options, but with cars, there are even more picking options. Many cars use wafer locks instead of a pin and tumbler. The ideas are very similar to one another, but wafer locks are much easier to pick. How a wafer lock is different, is that the key will move wafers instead of pins to a shear line, but those wafers may move in different directions. As a result of having the wafers not move in a uniform direction, you can rake the lock in seconds (by moving up and down in the keyway) or use what is called a tryout key (also known as a jiggle key or auto jiggler). Jiggle keys or tryout keys act similarly to a rake, but they are exclusively moved up and down while in the lock (opposed to in and out). If one key does not work you change out the key, and keep trying them out until you find one that works (which is how they got the name tryout keys). Something like a bump key will not work on a car lock. The trouble with picking, though, is that car keys have moved into the electronic age. The newer cars have transponder chips that send signals to the car as the key is used in order to prevent fakes and duplicates. Until the car is open and a locksmith can access the onboard computer of the vehicle, there is no way to program a new transponder key or manipulate the car’s transceiver. Picking the lock essentially acts as a fake key so this technology prevents this type of entry. Raking, jiggling, and single pin picking are all rendered useless without the transponder in the actual key. Proximity is also a factor, so even if the key is locked in the car it will not send the signal the correct distance. Depending on the car, the signal will need to be more exact, with some needing the precise distance from the chip’s placement on the key to the key fully inserted into the lock. Picking your car’s locks might be easier than picking the locks on your home. Jiggler keys or Tryout keys can be very effective on wafer style locks, common in many cars. With the digital age upon us, it is almost impossible to pick some newer model car locks. Now that you have keys (no pun intended) to opening up your locked car you should be able to adapt to any situation. For example, I was in Hawaii and locked the car while the keys were still in the ignition. We were unloading for the beach, a lot of things were happening, but I still feel ridiculous for having it happen. But this isn’t a therapy blog, this is a locksmithing blog. I can’t tell you how to get over your regret of leaving those keys in the car, but I can tell you how I got back in. Everyone I was with either had a cell phone that was dead or was trapped in a locked car, so half of the group split up to look for some help. While waiting by the car I reach up into the tree and found a wire coat hanger. It was a pretty remarkable coincidence, but it is paradise after all. I made a probe, as described above and slipped the hanger between the door frame. I was able to press the thumb lock and unlock the car without so much as a scratch. So be prepared and don’t allow yourself to be overwhelmed by the situation. Take precautions, and if at all plausible have a friend or relative that you can give a spare key to. And if worse comes to worse look around you for makeshift solutions, you never know what you might find.